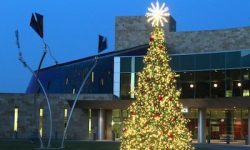 Large outdoor LED Christmas Tree designed for cities and businesses to bring some extra holiday cheer. Uses 90% less electric than traditional trees. Sizes from 16' to 100'. Custom options available.